Kitt's World: Let the holidays begin! Are you ready for Thanksgiving this week? I'm busy and trying to get my posts done for my challenges and my computer is just not cooperating with me uggh. Well it seems to be working now so lets get to today's challenge. This is for the the challenge over at Artistic Inspirations be sure to stop by and see what the talented DT has for you holiday inspiration. Join in the challenge to win some free images from our sponser Squigglefly. Here is my easel card using their cute kitten and mouse image. I used the Silhouette Cameo to print and cut the image and card. 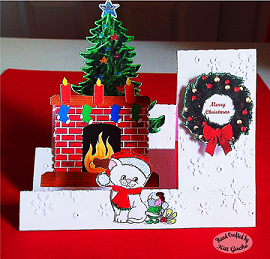 For the base card I used the Cuttlebug snowflake embossing folder. The wreath, fireplace and tree were also done with the Silhouette. I used Spectrum Noir markers to color the cat and mouse and I used Stickles Diamonds on the brim of the cat's hat. Thanks for stopping by today and leaving your comments. I'm hoping to post a couple more projects this week. Have a wonderful Thanksgiving. Have a happy crafty day. Toll gewerkelt. Danke daß du bei den AF mitmachst. Oh, i really like this, amazing card and a sweet cat.